Penhaligon’s Orange Blossom, 2010 reorchestration of the 1976 release, composed by Bertrand Duchaufour: really very nice. I had bought this small split portion a couple of years ago, and then apparently “put it away for safekeeping”, which any fool knows is like tossing things into the Bermuda Triangle: you never know if you’ll see those items again. I found the decant when cleaning out my closet recently and, despite barely remembering buying it, decided to give it a shot. Regular readers know that I Haz Orange Blossom Issues, by which I mean that OB fragrances nearly always smell like soap on me. I mean, it’s generally nice soap, of the creamy Dove kind, but still: soap. Bleagh. Don’t get me started on the list of OB scents that do not work for me, because it’s long. If they don’t smell like soap, they smell like candy. I really like By Kilian’s (pricey) Sweet Redemption, which is orange blossom and myrrh, but every time I wear it, Taz says I smell like grape and root beer lollipops. (Not that there’s anything wrong with that.) Honestly, I can’t remember why I went out on a limb for a 5ml split portion of the Penhaligon’s, other than I remember hearing it was good. I’m glad I did, though. This one is distinctly un-soapy, which is a blessed relief, and more floral than candy-sweet. It’s a simple-seeming floral fragrance that is what I’d call a true soliflore, in that although there are materials in it other than orange blossom (notably petitgrain, jasmine, muguet, violet leaf, virginia cedar, vanilla), it mostly smells of orange blossom all the way through. The angle of light shining on the flowers changes, from a lemony-green sparkle up top to a warm, mellow, honeyed base. It’s lovely. It also only lasts about three hours with a moderate spritz, so the Annick Goutal spray-until-wet method would serve you well with it. A couple of other reviews of the Penhaligon’s: Persolaise, Scent Epiphany and Olfactoria’s Travels. Lubin Epidor: Angela’s review on Now Smell This last May made me think that it would not be up my alley in the least. “Thick”? Not my kinda thang. And Lubin’s ad copy mentioning peasant girls and ripe wheat and dreams is soppy and even more useless than ad copy usually is — even from Lubin, which is famous for its ridiculously OTT ad copy. But then my almost-Evil Scent Twin Kafkaesque reviewed it and said it was very simple, linear, but called it “cozy comfort” and said she needed a decant. And then March’s review of it on Perfume Posse in December made me think that I needed to try this. She called it “unashamedly romantic” and “narcotic,” and told me the base was more hay/woody than sweet vanilla. So I ordered a 1.2ml spray sample. La Faneuse by Emile Claus. Epidor smells like these colors: wheat and white and blue, all layered with honey-golden light. And y’all, it’s gone already. I used it up. I like it that much. The notes include violet, plum, orange blossom, jasmine, cedarwood, sandalwood, vanilla and tonka bean. It is not complicated at all: it is just so golden and pretty. I get lots of violet, a haze of white florals, then a gentle wheaty, almond-cake drydown. Which sounds like not much, right? but it’s just so dang pretty, and it smells relatively natural. None of that blocky, lab-created jasminoid thing that annoyed the pants off me in Twilly d’Hermes. No buzzy Ambrox. I’m not saying there aren’t any synthetics in it, I’m just saying that the synthetics in it are not ones that trip my “this smells like Chem 102 lab” threshold. Pretty, isn’t it? Also kinda floofy. Ad copy mentions sparkling champagne and sequins; the bottle is floofy (see left). But the notes list is pretty simple: bergamot, black pepper, tonka, frankincense, white flowers, vanilla, white musk. The fragrance is pretty simple, too. It’s basically . . . vanilla. To confess, I’ve never tried what’s generally recognized as the ne plus ultra of vanilla fragrances, Guerlain’s Spiritueuse Double Vanille. (SDV itself has been revamped in the last couple of years anyway, and aficionados say it isn’t as long-lasting now.) Never mind the fairly malicious review of it in Perfumes: The Guide, because people who love vanilla still love SDV. Haven’t smelled L’Artisan’s late, lamented Vanilia, either. I did enjoy a sample of Dame Perfumery’s Black Flower Mexican Vanilla, though it’s a tad more powdery than I’d prefer. In fact, on my skin Nuit et Confidences was so straight-up vanilla that I got out a bottle of vanilla extract to compare it. The extract lasts longer — and is significantly less powdery. Now, for full disclosure, my bottle of vanilla extract is actually double-strength Madagascar bourbon: fairly expensive stuff from The Spice House, with vanilla bean in the bottle, absolutely worth its weight in gold. It has taken me three years to get the bottle down to the last teaspoon, and that vanilla bean has been macerating in there for long enough to infuse the stuff with real magic. At the current price point, it’s $26 for a 4 oz. bottle, compared to $190 for 3.4 oz. of Nuit et Confidences (currently out of stock at the Goutal’s US website). Frankly, my dear, I’d rather have another bottle of the double-strength vanilla extract. Le Galion La Rose – a 2014 reorchestration of a 1950 fragrance, La Rose is not the soliflore I’d thought it would be. It is warm and woody, and yes, rosy. Very attractive, comfortable, pleasant; more interesting than a plain rosewater scent but I find it quite comforting. I have no idea what “water peach” is, but La Rose doesn’t accent any peachy notes. It’s not particularly vanilla-y either, which is refreshing. I mean, a gourmandy rose-vanilla is always nice (Rochas Tocade, Lush Rose Jam, Montale White Aoud, etc., etc. ), but this one is mainly fresh pink rose and soft woods. Very lovely. Lasting power is about average for an eau de parfum on me, 4-5 hours, and the sillage is mild to moderate. €140 for 100ml, €9 for a 6.5ml mini at the Le Galion website. Short reviews at What Men Should Smell Like and Colognoisseur. Dame Perfumery Desert Rose – A bit of overlap here with the Le Galion, but… you know. Rose. Duh. I’m always a sucker. I suppose in my mind, a desert rose would be dry, but Desert Rose is quite pleasantly fresh and dewy, at least for the first half. I was thinking that “Damascenia Rose” was a typo, since I had only ever seen it written “damascena.” Turns out that Damascenia is a Firminich molecule. Whatever it is, it’s really pretty in this fragrance, which does smell fairly natural. I get little touches of peach in it, as well as carnation, but as it wears on, the whole thing goes a bit soapy. $85 for 100ml edp spray, $35 for 10ml oil rollerball, $10 for $5ml edp spray. Short reviews at The Scented Hound and Scent of Abricots. The fancy engraved bell jar, which is even pricier than the regular $300 one. Serge Lutens De Profundis – I had only a vague memory of testing this one before — you know me, not the biggest Serge Fangrrl — and wanted to retry it. I am completely ignoring the wacko Serge description (death, chrysanthemums, carnality at the graveside ew ew ew, no, I’m not quoting it here) and the letter Oscar Wilde wrote to his bosom buddy Lord Alfred Douglas from prison, which is the purported inspiration for the fragrance. And maybe the Fleurs du Mal Baudelaire reference too. “Life!” by Mohan Nellore at Flickr, some rights reserved. De Profundis the fragrance does not move me the way the Rutter does, but it is very very pretty. Yes, I just called a Lutens “pretty,” and I’m not takin’ it back. It’s pretty, y’all. Shaddup. It is both bold and tender at the same time, quite floral and cool and meditative, and while that may be because I don’t associate any particular flower with funerals, still. I like chrysanthemums in flower, and I like them in this fragrance along with the carnation and the violets and the incense. I could wish for better projection and longevity from this one, at least from a heftily-dabbed sample. Maybe it’s better with a spray application, but I got about three hours’ wear and very little sillage. Other reviews: Grain de Musc, Kafkaesque, Bois de Jasmin, Scents of Self, Patty at Perfume Posse. I was going to do my usual history-in-brief, but I think I’ll just link to the Fragrantica info on this perfume house, and get straight on to the frag reviews. My sample set came with seven scents, really nice sturdy 2ml sealed glass spray vials, and then I managed to scrounge up a couple more in the standard decant service 1ml dabber vials. Deep breath. Okay, I’ll start with the ones I didn’t hate and proceed from there. Reve D’Ossian – The name makes reference to Ossian, the purported author of a cycle of epic poems in Gaelic (really the 18th-century work of James MacPherson), and the notes are aldehydes, incense, pine, cinnamon, benzoin, elemi, tonka, guaiac wood, opoponax, balsamic notes, sandalwood, leather, labdanum and musk. Longtime readers will look at that list and think, Okay, Mals is gonna definitely hate this. I thought I would, too. I don’t. It might be my favorite of the nine I tried – not that I’m jonesing for a larger amount of it, but I enjoyed wearing it. It does that cool-and-meditative thing that incense does, and when it softens into the basenotes it gets comforting. Not ground-breaking, quite linear, but it holds a feeling of quiet, expansive equanimity for me. Heliotrope Blanc – I’m iffy on heliotrope, too. (Never once has perfumery heliotrope ever smelled like the plants I had growing in the front flower bed – those smell like jelly doughnuts! – but often will go very powdery or Play-doh-y.) This one is powdery, but pleasant nonetheless. Did I love it? Nope. Notes are orange blossom, heliotrope, violet leaf, almond, mimosa, iris, musk, rice, benzoin and tonka. I tested this on one wrist, with Parfums de Nicolai Kiss Me Intense on the other, and KMI was far more to my taste. Marions-Nous – The silly name means something like “let’s get married,” and of course it is a floral bouquet – with aldehydes, orange blossom, hyacinth, rose, carnation, ylang, iris, jasmine, cloves, tonka, civet, musk, and sandalwood. The preponderance of orange blossom in there pretty much guarantees its resemblance to scented soap to me. I mean, it’s nice soap. Nice soap is better than most of the rest of this fragrance line, IMHO. Relique d’Amour – okay, I didn’t hate this one either, though I didn’t mind it. It’s faint lilies, incense and a cold stone effect, but there’s also a hint of old vasewater and celery in there too. Official notes include: fresh herbs, pine, white lily, powdery notes, pepper, oak, incense, myrrh, elemi, musk, moss, waxed wood. I wished to pick up the “waxed woods” note, but didn’t find it. Oeillet Louis XV – Y’all know I love carnations, except when they go bitter-soapy. This one is bitter, soapy, AND powdery, on top of cloying honey sweetness, and I really hated it. Official notes are carnation, pink pepper, mandarin, honey, white orchid, iris, rose, clove, rice powder, musk, woody notes. The topnotes are okay, and from there it keeps devolving further into OMG why did I put this on my skin? gedditoffme. Jardins d’Armide – I suppose it’s not all that weird that a company that used to make scented wig powder should feature powder in its modern creations, but this thing is OTT powdery. We are talking baby-powder BOMB, people. It starts off promisingly enough – I get the heliotrope right off the bat, and there’s a nice rose-violet, and then five minutes later I’m blinking from a Dumpster’s worth of powder. Remember the picture of that lady who was covered in dust after the World Trade Center bombings, and who died of cancer last year? (Prayers for her family.) That’s how I feel wearing J d’A. Official notes are rose, powdery notes, orange blossom, orris root, violet, carnation, wisteria, honey, almond, tonka bean and musk. Horizon – I didn’t expect to like this “oriental fougere”, and I sure didn’t. Petitgrain, tangerine, marmalade, rose, cognac, amber, tobacco leaf, cacao, almond, oak, patchouli, benzoin, ambergris, white tobacco, vanilla, honey, leather and peat. Sounds great, right? But on my skin, it’s a big ol’ slug of patchouli and sweated-out booze, and it smells like poor judgment – not just no, OH HE** NO. Chypre Mousse – this is the reason I bought the sample set. I blame Kafka for this one; she is my Mostly Evil Scent Twin, but every now and then we have congruent tastes. I was expecting something like vintage Coty Chypre, or even original Miss Dior (which is an acquired taste, to be sure): green notes, moss, woody notes, and labdanum, a veritable Bambi’s Forest right there on my wrist. Instead, I got this pile of garbage right in the middle of said forest. Yes to moss and a hint of galbanum, but also tons of dirt and garbage atop it, with the sour fizz of rot over all. It gives me enormous stonking headaches every time I try it, and terrible nausea. Every member of my family recoiled from me with horrified expressions, so it wasn’t just my sniffer. Sprayed on paper, I pick up fleeting impressions of various woodsy things – wet fern, mushroom, raw chestnut, something sweet like pipe tobacco, and was that mint? – amid the overall greenness. On my skin? Awful. Indescribably awful. A decomposing mess. But the worst disappointment for me was Deja le Printemps. Described as a gentle green floral, it seemed like the one most up my alley, and I didn’t check the notes list (mint, orange blossom, chamomile, fig leaves, clover, mown grass, lily of the valley, galbanum, musk, vetiver, cedar, moss) before trying it on skin. You saw it in the list, right? It’s there. I should have known: those blasted fig leaves. It looks so innocuous, doesn’t it? NOT. I’ve never experienced live fig trees or eaten fresh figs (I love the dried ones, which are the only ones you can get in this temperate zone), so I do wonder how I’d react to this bitter, acrid green scent in the wild, so to speak. I don’t usually mind sour, pungent notes like blackcurrant or grapefruit – but fig leaf just does me in. I hate it. I could not wait to get Deja le Printemps off my skin. I stuck it out for two hours, and then just could not stand it any more. The galbanum in this thing was pretty and soft, and everything else just lovely, but that (@*% FIG LEAF… I’m still mad about it. Oriza L. Legrand’s range includes sixteen fragrances; I tried nine. I might be interested in giving Muguet Fleuri a go, and I wouldn’t turn down a shot at Violettes du Czar either, if I didn’t have to buy it. I don’t know how different Royal Oeillet is from the earlier rendition of Louis XV or whether to bother with it. However, I have zero interest in Villa Lympia, Vetiver Royal Bourbon, Foin Fraichement Coupe (perfumery hay absolutely never smells like hay to me) or Cuir l’Aigle Russe. I am now sending my Oriza samples off to a new home, where I hope they’ll be welcome. How have you done with this house? Like it, love it, hate it? I’ve been testing a few things new to me and trying to work my way through the Sample Stash, having becoming interested again in sniffing things other than my favorites. So here goes! L’Wren Scott (for Barneys): This perfume, released by the model and designer in 2009, in conjunction with her design label, generated some buzz around the time of its introduction with the then-staggering price of $195 per 100ml bottle. It’s a price that certainly seems less staggering now, given the price hikes we’ve seen across the board, but it was a shocker at the time. Scott, who was dating Mick Jagger for a time, died in 2014 and her business folded, of course. I’ve recently seen bottles on eBay for $50, so it’s within reach now of those of us not able (or willing) to drop big bucks on our fragrance. Ms. Scott said in interviews that she mixed her own oils and was highly involved in the creation of her fragrance, from the notes to the packaging. This I believe – celebrities who are interested in fragrance for itself tend to release fragrances that are interesting, at least. This one is downright quirky. First, it’s a spicy floral modern chypre. And when I say “spicy,” I don’t mean cozy baked-goods spices like cinnamon. I mean anise, artemisia, curry tree, coriander and cloves. The anise seems prominent to me, but the effect is highly aromatic in an unusual way. There’s a ton of patchouli, and lots of jasmine and geranium – very little oakmoss, but this is a chypre in the modern style. It’s big, bold, and in character something like that 80s beast, Ungaro Diva. Oddly for something so bold, it doesn’t last very long on my skin. It’s aromatic and woody enough that I would think it would be perfectly comfortable for a man to wear. Here’s a masculine take on L’Wren Scott, at CaFleureBon. I would have liked this bottle were it not for the plug-ugly lettering. Bleah. Blue Encens has the traditional incensey mix atop a dry (not sweet) amber, with cool spices. It reminds me a good deal of the late, lamented Comptoir Sud Pacifique Eau du Gouverneur – all that pepper and sheer spice! It’s not particularly ashy, nor very woody. Nor is it groundbreaking; it’s just nice. I enjoyed this one. Perhaps it’s not a surprise that I did – its composer, Evelyne Boulanger, also worked on CdG Zagorsk (speaking of which, I like it again). A few more reviews: Ann at Perfume Posse; Katie Puckrik Smells; Bois de Jasmin. 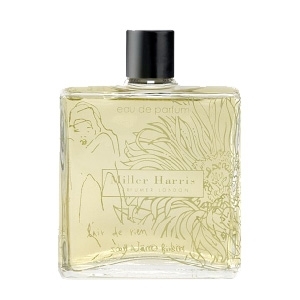 Miller Harris L’Air de Rien: Luca Turin’s review of this one in Perfumes: The Guide doesn’t make it sound like anything I would want to wear. However, there’s a regular commenter on Now Smell This who loves it and finds it comforting. I can’t remember which of her mentions of it convinced me that I needed to try it, but I’m pretty sure she talked me into it. The notes listed are simply neroli, patchouli, oakmoss, amber, musk and vanilla. Of this one, Turin says, “It smells of boozy kisses, stale joss sticks, rising damp, and soiled underwear. I love it,” and gives it four stars. Eww. To me, however, it simply smells like “skin musk,” with perhaps a veil of that “old books” smell. I mean, I can smell it, but it sort of melts into the skin and becomes a pleasant ambient scent. I don’t get a lot of patchouli in this, though I expected to. Would I wear it? Probably not, but that’s more a matter of finding it unexciting than finding it dirty. Okay, so it’s MUSK. We know what happens with musks – they’re large molecules right at the edge of human perception, and many people are anosmic to (they can’t smell) several musks but can smell others. I suspect this is what happened to me with Smell Bent’s Commando, a fragrance recommended by Tom of Perfume Posse and Perfume-Smellin’ Things as smelling like the “impeccably clean skin of a child.” Um, nope. Nope. That thing is crowded locker room all the way, dude. And Patty at Perfume Posse calls L’Air de Rien “the huge catbutt perfume that skanked its way across the perfume universe,” at first, before deciding it was a lovely musky leather. Other takes on L’Air de Rien: an excellent, informative double review from Denyse Beaulieu and Elena Vosnaki at Perfume Shrine, Victoria at Bois de Jasmin, and a rather negative one from Katie Puckrik Smells. Bonkers about Perfume and EauMG got much the same out of it as I did. Dirty? You’ll have to try it yourself. Burberry Weekend for Women: According to Fragrantica, it’s a fruity floral with some powdery notes. I thought it might be safe to test it when going to the salon for a haircut-and-highlights, but wound up having to scrub it off. Why? It smells of adult diapers to me – that is, stale urine. It’s horrible. More mini-reviews coming soon – I’d forgotten how much fun this is! Caron Pour une Femme – I’ve been interested in trying this for some time now. C’mon, I know that I don’t typically get on with the classic Caron fragrances (oh, don’t get me started), but this one is typically labeled a floral chypre. Okay, maybe we could be quibbling over whether it’s a floral chypre or a chypre floral – that is, whether it is primarily a chypre with a strong floral angle, or primarily a floral with chypre undertones. That’s a distinction I don’t feel myself particularly qualified to answer. However, Pour une Femme, originally released in 1934 and reformulated who knows how many times (definitely in 2001, when it was reorchestrated by Richard Fraysse) is actually one of those modern chypres. I smell very little oakmoss in here. Plenty of dark marmalade-y orange to start with (as with many Carons, the topnotes are not particularly nice), plus a deep rose and some orange blossom. Lots of patchouli, lots of amber. Deep into the drydown there’s a bit of incense. It’s pleasant. If you’re a Coco Mademoiselle/modern floral-chypre fan, it might suit you well. I’m glad I sampled rather than springing for one of those adorable silhouette bottles – seriously, is this not a fabulous bottle? I love it. It goes more ambery the longer it’s on skin and I like it less. Notes (via Fragrantica): Orange blossom, mandarin, orange, incense, rose, vetiver, musk, sandalwood, amber. The patchouli isn’t listed, but it’s there. Another review: Victoria at EauMG. Uzac Satin Doll – yes, another one of those modern floral chypres. There’s quite a bit of raw-carroty iris root in the topnotes of this one, though, and I rather like it. Can’t help being unimpressed in the first half hour, though, because where’s the tuberose? I was promised tuberose. And rose. And incense. This one, I like more and more the longer it’s on skin. Oddly, the florals show up deeper into the base than they typically do, and they stick around awhile. It’s really lovely; I find myself thinking of Penhaligon’s Eau Sans Pareil (the new one – I never smelled the older version) and how refreshing and elegant it is. Iris can sometimes feel satiny to me, and I like its presence here in Satin Doll. There is actually a bit of oakmoss in here, though I find myself wondering if it’s the atranol-free version. Not that that’s bad, necessarily – it just doesn’t feel like an old-school powerhouse chypre. Which is not a dealbreaker for me. The patchouli, too, is the heart-note stuff, very green and austere, no powdery dirt mess. There’s a good bit of wood in here, and a bunch of black pepper. I seem to have gotten more iris out of it than some other reviewers did, but since I’m not particularly fond of rooty iris, that isn’t really an enthusiastic recommendation. This is a nice smell. Not shelling out for it – and it doesn’t smell much like the song sounds to me – but it’s nice. Two more reviews for you: The Silver Fox at Ca Fleure Bon and Angela at NST. Notes (Fragrantica): elemi, pink pepper, black pepper, iris, tuberose, jasmine, rose, myrrh, incense, patchouli, opoponax, oakmoss. I had also planned to include a review of Bogue Maai, but my reactions to that one were… um… unconventional, to say the least, so I’ll be putting that review up later. I’ve also got reviews for Hiram Green Moon Bloom and Shangri-La written, as well. Watch this space for those.